The Science Achievement Awards recognize staff, students and faculty whose contributions in areas such as service, administration, leadership and outreach have had a significant positive impact on achieving the goals of the Faculty of Science. Not only do outreach activities play a valuable role in promoting public awareness and understanding of chemistry, but they are also beneficial for the staff, faculty and students who volunteer. Volunteers become more effective and confident at communicating their knowledge and expertise to audiences with a basic understanding of science. 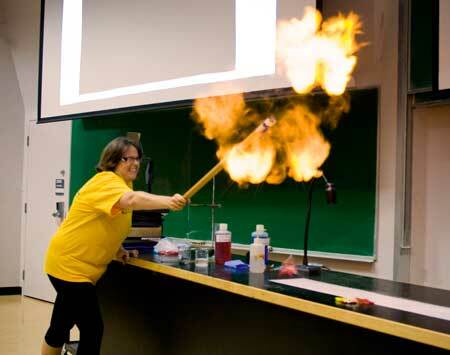 The Department’s current outreach activities include school fieldtrips, participation in the Brainwave summer science camps, the Chemistry Open House (set to be an annual event coinciding with National Chemistry Week), the Faraday Show in collaboration with UBC Physics and Astronomy, the annual High School Lab Skills Competition, Alumni Weekend and the upcoming Chemistry Alumni Reunion. Additionally, Chemistry has an ongoing presence at Science World where a team of volunteers spends one Sunday each month promoting chemistry to kids and parents. To find out more about our Outreach events, or to volunteer, contact Angela Crane at outreachTA[@]chem.ubc.ca.